Constructing a swimming pool in your backyard can be one of the best decisions of your life. One of the most important aspects of owning a swimming pool is being on top of safety. There are several safety aspects to consider before installing a swimming pool, including fencing, pool covers, maintenance and whether or not you have knowledge of resuscitation. Pools are obviously lots of fun, but it’s super important to make sure everyone is safe and sound as well. It’s important to note that while everything discussed in this article is a necessity for owning a pool, some of these points are actually legal requirements. Check out the relative laws in your state before constructing your pool. Children need constant supervision around water. It can take as little as 20 seconds for a child to become fully submerged, so keeping them out of the pool area when you’re not there is a necessity. Because of this, constructing a fence around your swimming pool is a legal requirement. All pools and spas must have a continuous safety barrier that restricts access to the pool by young children. Your pool fence must be at least 1.2 metres high, and children shouldn’t be able to crawl underneath it. Gates to the pool area must swing outward, be self-closing and fitted with a latching device at least 1.5 metres off the ground. Safety around water is the most important thing to think about when buying a pool. Investing in a set of covers for your swimming pool can be beneficial in many ways. They conserve water, they reduce the amount of chemicals you use, and they also keep leaves and other debris from falling into the water. On top of this, they also save you money on your energy bills! The unfortunate thing is that pool covers can become quite dangerous if a child or pet falls on top whilst they’re covering the pool. Despite this, operating them safely is very easy to do. All you have to do is make sure children and pets are never left unsupervised whilst the covers are on. This shouldn’t be a problem, thanks to the fancy fence you installed around your pool area! It’s also a good idea to ensure the covers are completely rolled up before allowing children and pets into the pool area. You consider servicing your car a pretty important process, right? Well, the same goes for your pool! Maintenance is important if you want to keep your pool in tip top condition. Arguably, the most important part of maintaining your pool is regulating the amount of chemicals in the water. Keeping your pH between 7.0 and 7.4 will ensure the water is safe to swim in. If your pool uses a chemical disinfectant, you should also check the levels on a regular basis. If you use an alternative method of disinfection such as a UV light or ozone therapy, you should try and have your units serviced on a regular basis. If you haven’t cleaned it for a while, you might be a bit surprised by how dirty it actually is. A dirty filter will struggle to do its job, meaning it’ll be harder to disinfect your pool. Alternatively, you can hire a professional to do this job for you! 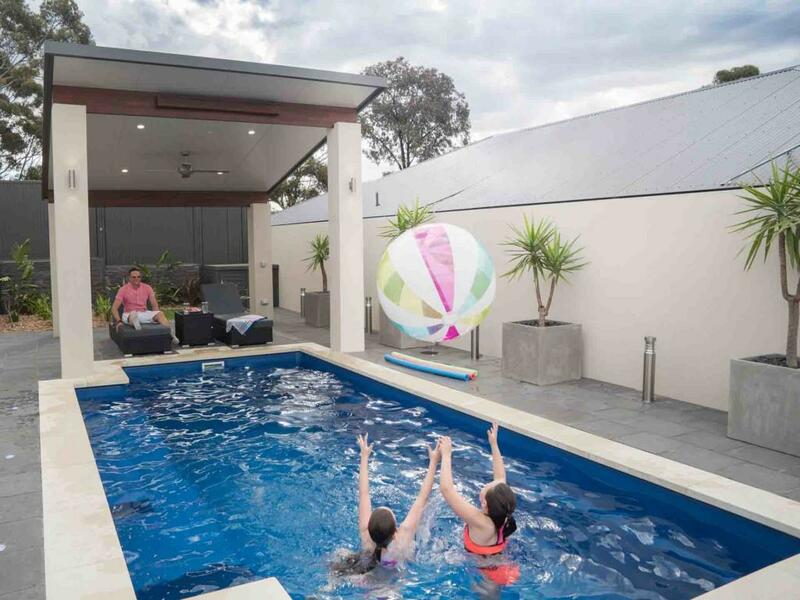 Australian Outdoor Living offers a great-value mobile pool service that comes to you. With basic services starting from just $65, our mobile pool maintenance service is perfect if you’re short on free time. Make sure someone on the property is trained in first aid and resuscitation. Having basic first aid knowledge isn’t just important around water; it’s also a useful skill to have in any scenario. Having knowledge of first aid could come in handy at any time, and even has the potential to save someone’s life. That potential increases tenfold if you have a swimming pool in your backyard. Backyard pools are legally required to prominently display signage to assist when providing first aid and CPR. It is also highly recommended that someone on the property is trained in first aid and resuscitation. We’ve even put together this handy video featuring our very own AJ! Listen to him carefully, he knows what he’s talking about. Everything discussed in this article is considered a legal requirement in the state of South Australia. Requirements vary from state to state, so it’s a good idea to check your state’s legislation before buying a swimming pool.